Pupils at the Hounslow Heath Infant school ( children aged 3 – 7) just under a Heathrow flight path, have very loud and intrusive aircraft noise from the planes flying some 180 metres approx overhead. The problem is so bad that BAA (as it was) paid for the construction of some adobe structures in the playground, so the children can spend at least part of their time outdoors in places where they can hear each other speak. At some times of day, there is aircraft noise for 25 seconds out of every 90 seconds. Classes of up to 30 children can be seated inside the main dome, and inside the noise is reduced by some 17 decibels. Outdoor learning is valued by teachers and is also a statutory part of the national curriculum. The headteacher said the adobe structures are important as refuges because “When kids are playing they are also developing their language skills, and in the playground again they’re being interrupted.” Schools should not be located under flight paths where planes are low. 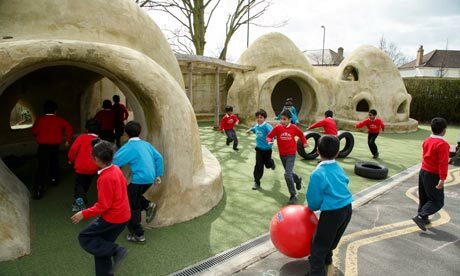 Buildings originally designed for earthquake and emergency zones in Asia and Africa are now being erected in London playgrounds to shield schoolchildren from the noise of aircraft landing at Heathrow. Four “superadobe” domes have gone up at a primary school in Hounslow, under the flight path for Heathrow’s southern runway, and two other schools in the area plan to build similar structures. Constructed from coiled bags of earth with white plaster walls, the domes reduce the roar from incoming aeroplanes by 17 decibels for pupils inside. The domes’ builder, Julian Faulkner, said he had constructed about 70 homes and shelters using the same materials and techniques more common in Africa and Asia, predominantly in Nepal’s earthquake-prone Kathmandu valley. Planes pass 180 metres (600ft) overhead at Hounslow Heath infant school on their way to land at Heathrow. Faulkner said he was shocked by the sight of children clasping their hands over their ears in the playground. He said the buildings helped to mitigate the planes’ impact, “both of the noise and psychologically”. Classes of up to 30 can be seated inside the main dome, which has a diameter of 5.2 metres, with space for more in a sunken amphitheatre outside. Another Hounslow primary nearby and a school in neighbouring Slough have commissioned their own adobes from Faulkner’s firm, Small Earth. The superadobe design was an invention of the Iranian architect Nader Khalili, originally with a view to lunar settlements but first employed in a refugee crisis after the 1990-91 Gulf war, before answering the needs of west London’s noise-afflicted schoolchildren. The buildings can withstand tremors with a magnitude of up to 5.7. Their domes are also immune to the damage occasionally wrought on local homes’ tiled roofs by vortices from incoming jets. The headteacher, Kathryn Harper-Quinn, estimates that when outside, teachers are rendered inaudible to pupils for 25 seconds in every 90. “I’ve been very concerned about the effects of the noise on the children’s learning,” she said. In the huts, she added, “you can still hear the planes but you can also hear your own voice”. She said that as outdoor learning was both valued by teachers and a statutory part of the curriculum, staff had developed strategies to deal with aircraft noise, including the use of whistles to alert children who could not hear when teachers were speaking. Within the main building of the school, which teaches 520 infants aged between three and seven, special soundproofing measures are in place which diminish, but do not eliminate, aircraft noise. Hounslow council has launched a public consultation on the effects of aircraft, sending 100,000 questionnaires to its residents, to form its submission to the Davies commission on airport capacity in south-east England. The commission will report in 2015 on the need for new runways, but may also propose measures later this year to permit more flights at Heathrow. The council has decided against a simple yes-no referendum on Heathrow expansion, as favoured in neighbouring boroughs, as it recognises that the airport is a key local employer and most residents’ views are nuanced. However, it has backed calls from the London assembly member Murad Qureshi for a total ban on night flights. It also wants to see improved noise mitigation measures. Under a current scheme, Heathrow pays for the installation of double glazing in the bedrooms of houses within a designated “noise contour”, where aircraft noise regularly exceeds 63 decibels. The airport has also funded the soundproofing of certain public buildings, although the council argues that the money is inadequate for both soundproofing and ventilation. The article refers to children’s learning – not actual damage to their hearing. Just to provide a context, normal conversation is equivalent to a level of 60 decibels (not loud enough to cause damage) and we are told here that if aircraft noise regularly exceeds 63 decibels then there is a scheme whereby Heathrow will pay for the installation of double glazing in bedrooms. The noise level needs to be about 85 decibels before damage occurs (new safety regulations in the UK necessitate the wearing of hearing protection above 85 decibels). However there is some evidence here to suggest that the children are being exposed to higher levels than that of, say, a normal conversation (60 decibels). I think that it would be a good idea if someone actually measured the noise levels in their playground over a period of time – just to be sure that this problem is not only hindering the learning process but actually causing long term damage to their hearing. 15.4.2013The head teacher of an infant and nursery school directly under a Heathrow flight path, close to the airport in Hounslow, has been speaking of the impact of the planes on the learning of children at her school. Kathryn Harper-Quinn, who runs Hounslow Heath Infant & Nursery School said a recent study had highlighted the dramatic impact planes thundering 600-feet overhead have on children’s learning. Asked to recall factual details from an outdoor lesson, she said, a class of 7-year-olds could remember about a third less than those hearing the same lesson in a specially built noise-insulated hut. When the study was repeated with a fictional story, there was no noticeable difference in performance – a result Ms Harper-Quinn put down to pupils being able to fill in the gaps more easily. Speaking at the official launch of Hounslow Council’s consultation on Heathrow, she claimed a 3rd runway would blight thousands more children’s education. The consultation questionnaire contains 11 questions, and the deadline for responses is May 16th. … Hearing the sounds of birdsong, grasshoppers, water flowing, or wind rustling in trees is a rare experience when the natural sounds are drowned by NOISE POLLUTION.